I rarely go full on boho with my looks; I like the ability to show off my shape in some way and prefer a bit of structure in each look. However, I grabbed this Zara tunic the second I saw it in stores. It is so simple, yet the details make it so interesting. Plus, popular trends for spring include fringe & tunics. Nothing I love more than killing two fashion birds with one stone. PS. Be sure to enter the Fake a Spring Break giveaway to win a bunch of stay-cation goodies! Visit the original post here to enter! Contest ends 4/13 at midnight! Thanks for stopping by my blog! I tried to respond to you via e-mail but it has you as a "no reply blogger". Just wanted to let you know, in case you wanted to fix it :) Have a great weekend!! This tunic is amazing! It looks great on you and I love that you are all about the fringe! What an awesome boho look! And I love that bright red bag. Really adds a splash of colour! Thank you! I loved the fringe tassel detail on the bag! 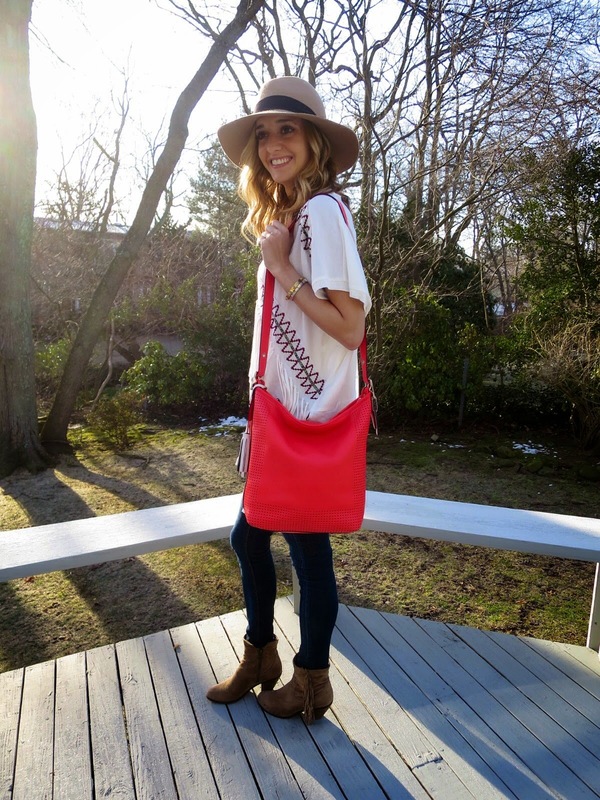 Your shirt is gorgeous, but what really stole my heart in this outfit is your bright red purse :) Lovely! Thank you! 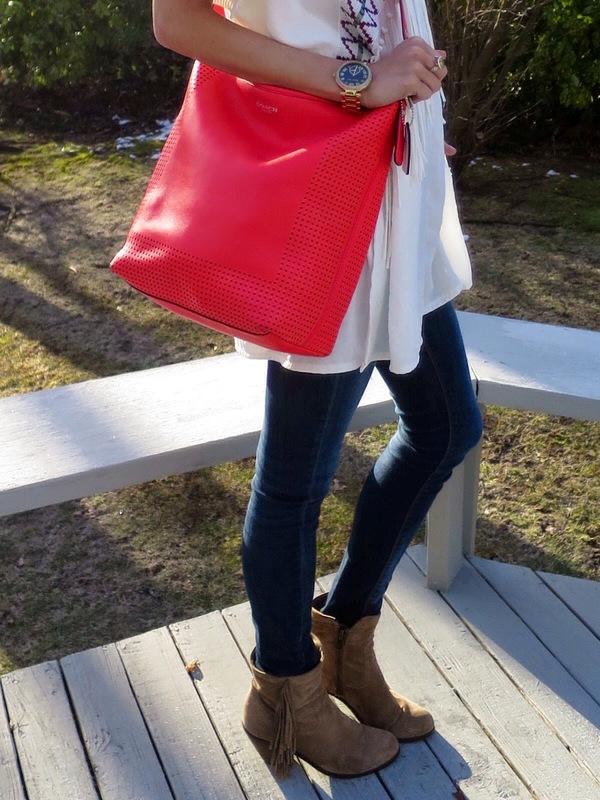 This bag is such a classic Coach shape but a fun color for spring! 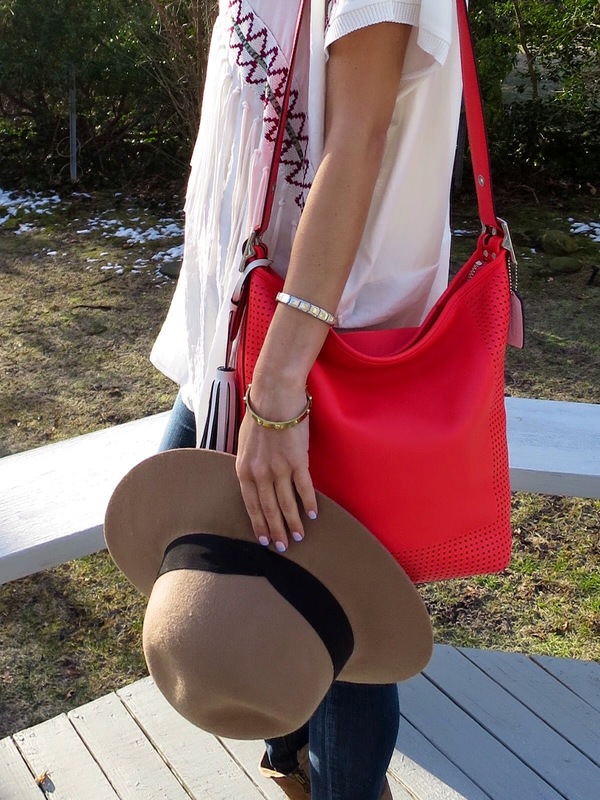 Very cute top and i love the pop of color with the bag. Thank you! It is a great spring accessory! Michelle I would just like to say that you could seriously wear a friggin trash bag and still look amazing. You are so so so sweet!